The TJ Ford Invitational 2019 will be held March 22-24, 2019, at the Round Rock Sports Center. Register your team today, or watch the incredible talent as a spectator at this exciting basketball event. 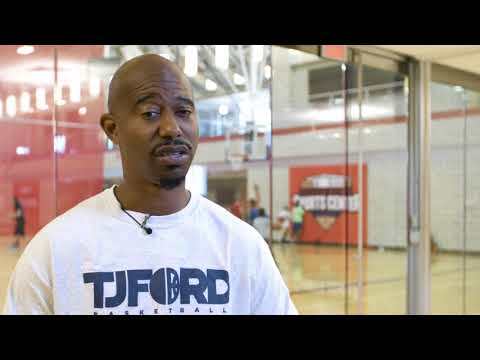 All of us involved in the T.J. Ford basketball program are committed to success on the court. In the process of achieving that parameter of success, we also acknowledge that the world outside the gymnasium is where the true success and fulfillment can be found. This means we are competitors without equal. We, as players and coaches, are striving to make sure that no one prepares more thoroughly or works more diligently to become a successful team than us. It also means giving our all in being students and coaches of TJ Ford Basketball. This means accepting out teammates and coaches as they are and molding ourselves to do whatever we can to make US successful. As a group, we are also remembering to enjoy each others company and have fun while we participate in this great game. In our off-the-court- lives, it means contributing our time to others, to good and worthwhile causes, and to the welfare of our families and loved ones. Playing and living our lives with class and integrity are values we treasure in each other and ourselves. TJ Ford was a two time state champion in high school, a college All American, won the prestigious Naismith College Player of the Year and John Wooden awards, and was named Player of the Year by Sports Illustrated, The Sporting News, ESPN.com and CBSSportsLine. He was a top 10 pick in the 2003 NBA draft. To honor Ford his #11 jersey was retired by The University of Texas, making him the fourth athlete in any sport (and the first basketball player) to have such an honor. He was inducted into the University of Texas Men’s Athletics Hall of Honor on November 1, 2013. A natural-born leader, TJ is now turning his attention to re-thinking youth basketball.